Stay in the kitchen, take the heat. Copyright © 2000 by Aqua Craft®, Inc. All rights reserved. 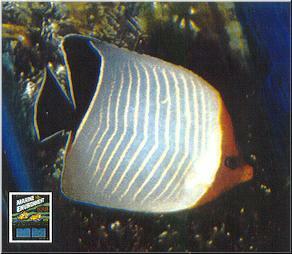 Chaetodon larvartusThis rare and exotic marine butterfly fish is collected from the Red Sea. In nature it feeds on a variety of corals in shallow water. 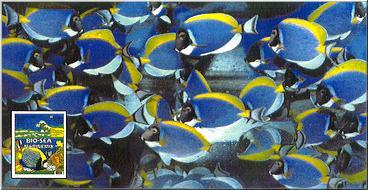 In the home aquarium it does best in a live coral or reef aquarium. This is a delicate fish and requires a little extra care to maintain it. It is shy and requires gentle tank mates. This Rust Face Butterfly is in 100% Marine Environment® dual phase formula™ and thrives in 75 gallon aquarium. Lighting consists of multiple power compacts. BI OX®; is used as the primary medium in a trickle filter. A skimmer is employed to remove dissolved organics. After a little over one year promoting this web site in aquarium magazines, search engines and related links, we are getting over 12,500 hits per month. Each month the number of hits increases. Thank you for interest and positive response to our efforts. People like the information we offer and the way it is presented. Subjects like: RO filtration, specific gravity, bromide, magnesium, pH and information and photographs on various marine fish and reefs tanks has all received great praise. By far the most response has been to the information offered from the S-15™ Report™ and related topics such as trace elements and How to Judge A Good Marine Salt. A minuscule number (approximately 0.0005% of the total number of visitors to this site) of apparently confused, thick headed or other wise guided via a hidden agenda people have voiced disapproval to comments made with information from the S-15™ Report™. That is, about 50 individuals from about 100,000 visitors to this site have either created a site to directly attack this on-line magazine or start and/or participate in a thread that attacked comments regarding items produced by Aqua Craft®. It is interesting to evaluate comments made on these anti-information sites or threads. There is not one instance of anyone attacking the actual S-15® Report®. Attacks are made on the comments or charts from the independent scientific results from this comparative test of marine salts. Acanthurus leucosternonThis hardy aquarium favorite is collected from the Bay of Bengal, Gulf of Siam and parts of the South China Sea. It prefers to be displayed in a well established, highly oxygenated, well lit aquarium with an abundance of green algae. Who are these people attacking information from an independent report? Why do the same people attack only products that scored high in a non biased test? Why do they avoid dealing with the reality that many other items did not score well? What would motivate people to start a web site for the specific purpose of attacking another site? Why would anyone start a thread to discredit scientific findings? Are these people “hired guns” or “cyber thugs” from rival marine salt competitors? I.e. Who signs their pay checks? They express confusion regarding how various values were put on the manufacture and composition of marine salts. A few individuals refuse to read a simple one page article on the essential parts of producing marine salts that hydrate with clean fresh water to near sea water standards. On the site that was created to attack The Marine Aquarist™ the author complained that we promoted via email that we now offer information on fresh water. He could not find anything on fresh water. Although one icon at the top right side of his screen showed a Lake Malawi Cobalt Blue Cichlid. On the same site we were criticized for offering a simple to understand and non technical on-line publication. Marine Aquarist™ is a labor of love for all involved. We delight in producing an easy to comprehend, informative and entertaining offering. If individuals want highly technical information, we suggest they buy books that deal with specific subjects of their interest. I would think it would clear the air of any confusion, misconceptions, or lack of understanding if concerned individuals would simply e-mail us with their questions. Rather than start a pathetic underground campaign to discredit efforts put forth by members in good standing of the scientific community and established honorable industry professionals. In past issues of the Marine Aquarist™ we have indicated that we have never met a group of people that fight to defend a position of total weakness. E.g. “I love my marine salt that scored under 30 out of a possible 100. I have never had any problems (that they are aware of). I use buffers to maintain proper pH, add various additives on a regular basis to make the salt better”. Didn’t these duffers understand what was offered in Issue #4, FAQ? It is most fortunate for the vast majority of aquarists that the number of these “throw-backs” remain at a low levels. In a city where multi million dollar projects are attended to on a daily basis, one of the cities major retail store closes. The store was established over 15 years ago. New owners took over about two years ago. The original owners were never entirely paid. The current owners go out owing several suppliers large sums of money. Another established store has opened a second location near the store that is going out. This store requesting vendors to offer extended terms. E.g. This store is expanding, but cannot stock and sell items that must be paid for in accordance to many suppliers terms. In Las Vegas, it appears that buildings, casinos and tropical fish stores come and go on a regular basis. When in Las Vegas be sure to check out the 50′ wide spectacular marine aquarium in the lobby of the Mirage Hotel. It is uses 100% Marine Environment® dual phase formula™ for the last 10+ years. Summer vacation is over and most youngsters are back in school. E.g. The chat rooms are free of unsupervised kids. However, there are still a few juveniles that continually ask meaningless or lame questions over and over. When information is offered that directs them to reliable established web sites or books, it is refused. Is our society producing a group of pusses that respond only to “instant gratification” rewards that may lack substance or accuracy? Is there a growing gap in parental guidance and contact with their children? It is amusing to interact with a certain level of individuals on the net. Many demand free items from manufactures, suppliers or retail stores. When informed, “giving things away” does not keep the lights burning, they get upset. Comments like… “Oh, you just want money… You are in it for the bucks” abound. Don’t we all go to work for a pay check? Unless you live at home, are on welfare, or attempt to exercise your perceived American right of, entitlement. Why do some people demand hand outs? Especially when we all understand, there is no free lunch.